Need help getting organized? 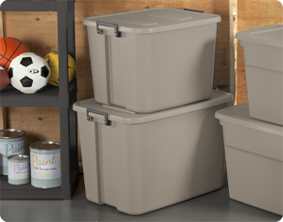 Step up to the 32 Gallon Latch Tote to solve a variety of basic household storage needs. Sort, store and conceal items in the garage, attic, basement, and closets. The color accent latches keep the lid secured to the base, yet are still easy to unlatch. This size Latch Tote is ideal for storing bedding, sporting gear, seasonal decorations and other large, bulky items. The contoured end panels and in molded handles provide a comfortable grip for lifting and carrying, making transporting the tote easier, whether moving into a dorm or storing away belongings in the attic or basement. The recessed lids allow same size totes to stack neatly on top of each other to use vertical storage space efficiently. The overall assembled dimensions for this item are 28 7/8" x 19" x 19 1/4". Overall Assembled Size: 28 7/8" x 19" x 19 1/4"
Totes help contain and conceal items such as sports equipment, camping supplies and more in the garage, basement or attic and offer a clean appearance. The modern-accent latch gives peace of mind that items will remain safely stored inside during transportation to and from locations. 32 Gallon Latch Tote is rated 4.8 out of 5 by 4. Rated 5 out of 5 by Carolyn563 from Quality goes a long way When buying totes, I want to believe that they will last almost forever. I have everything imaginable from a house stored in Sterlite totes. My things are protected and safe because of the quality in which they were made. Rated 5 out of 5 by LOVE IT! from I love the longevity of your products! I've used different sized Sterilite bins (they stack so easily) in my attic for the last 15 years. Attic equals hot & moist, especially in Florida. I've never had any cracks or malfunctions with any Sterilite product. The best part is that with the latching bins you never have to worry about bugs getting inside. I have boxes of items stored up there as well, they attack bugs of all kinds. With Sterilite, I've never had that problem. I'll be moving after 22 years and have decided that I'm never using boxes again! So, I will be browsing the ads to catch a sale on your Sterilite bins. Wish me happy hunting! Rated 5 out of 5 by PK from This product has great durability. I like that the contents stay dry. The Sterilite totes I have are my favorites to keep my clothes from water seeping in the garage, as well as the mice getting at them. I also like the ones I have that have handles. To me, they just let more security from critters of all kinds. Rated 4 out of 5 by homeschoolmomx4 from This product has great features This large tote has lots of room to store many items and keeps it sealed. Great product!